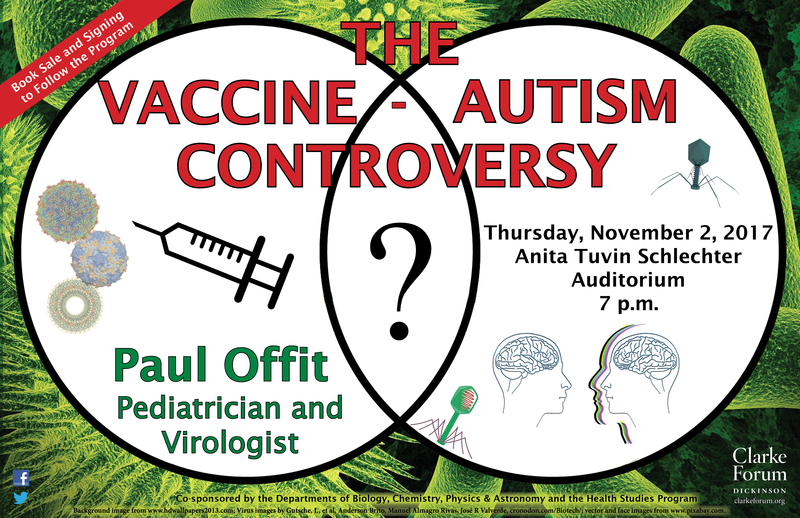 How have scientists, the media, and the public dealt with the question of whether vaccines cause autism? A book sale and signing will follow the presentation. The event is sponsored by the Clarke Forum for Contemporary Issues and co-sponsored by the Departments of Biology, Chemistry, Physics & Astronomy and the Health Studies Program. 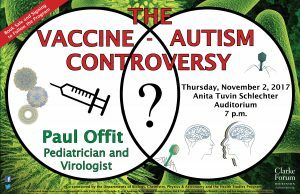 Paul A. Offit, MD is the director of the Vaccine Education Center at the Children’s Hospital of Philadelphia as well as the Maurice R. Hilleman Professor of Vaccinology and a professor of pediatrics at the Perelman School of Medicine at the University of Pennsylvania. He is a recipient of many awards including the J. Edmund Bradley Prize for Excellence in Pediatrics from the University of Maryland Medical School, the Young Investigator Award in Vaccine Development from the Infectious Disease Society of America, and a Research Career Development Award from the National Institutes of Health. Offit has published more than 160 papers in medical and scientific journals in the areas of rotavirus-specific immune responses and vaccine safety. He is also the co-inventor of the rotavirus vaccine, RotaTeq, recommended for universal use in infants by the CDC; for this achievement Offit received the Luigi Mastroianni and William Osler Awards from the University of Pennsylvania School of Medicine, the Charles Mérieux Award from the National Foundation for Infectious Diseases; and was honored by Bill and Melinda Gates during the launch of their Foundation’s Living Proof Project for global health. In 2009, Offit received the President’s Certificate for Outstanding Service from the American Academy of Pediatrics. In 2011, he received the Humanitarian of the Year Award from the Biologics Industry Organization (BIO), the David E. Rogers Award from the American Association of Medical Colleges, the Odyssey Award from the Center for Medicine in the Public Interest, and was elected to the Institute of Medicine of the National Academy of Sciences. In 2012, Offit received the Distinguished Medical Achievement Award from the College of Physicians of Philadelphia and the Drexel Medicine Prize in Translational Medicine fro the Drexel University College of Medicine. In 2013, he received the Maxwell Finland award for Outstanding Scientific Achievement from the National Foundation for Infectious Diseases, the Distinguished Alumnus award from the University of Maryland School of Medicine, and the Innovators in Health Award from the Group Health Foundation. In 2015, Offit won the Lindback Award for Distinguished Teaching from the University of Pennsylvania and was elected to the American Academy of Arts and Sciences. In 2016, he won the Franklin Founder Award from the city of Philadelphia, The Porter Prize from the University of Pittsburgh School of Public Health, the Lifetime Achievement Award from the Philadelphia Business Journal, and the Jonathan E. Rhoads Medal for Distinguished Service to Medicine from the American Philosophical Society. 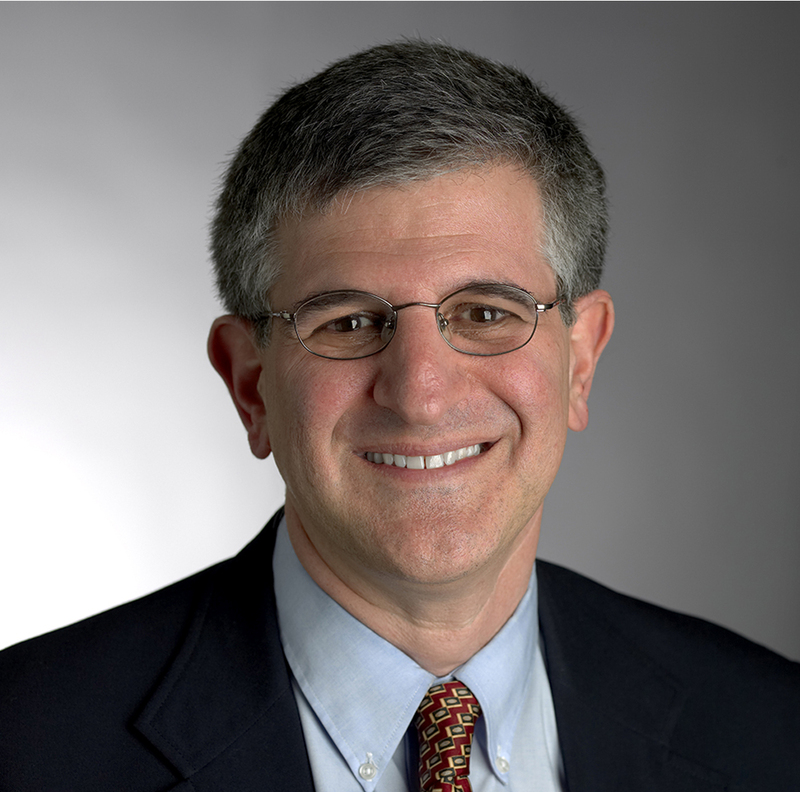 Offit was a member of the Advisory Committee on Immunization Practices to the Centers for Disease Control and Prevention and is a founding advisory board member of the Autism Science Foundation and the Foundation for Vaccine Research. He is also the author of six medical narratives: The Cutter Incident: How America’s First Polio Vaccine Led to Today’s Growing Vaccine Crisis (Yale University Press, 2005), Vaccinated: One Man’s Quest to Defeat the World’s Deadliest Diseases (HarperCollins, 2007), for which he won an award from the American Medical Writers Association, Autism’s False Prophets: Bad Science, Risky Medicine, and the Search for a Cure (Columbia University Press, 2008), Deadly Choices: How the Anti-Vaccine Movement Threatens Us All (Basic Books, 2011), which was selected by Kirkus Reviews and Booklist as one of the best non-fiction books of the year, Do You Believe in Magic? : The Sense and Nonsense of Alternative Medicine (HarperCollins, 2013), which won the Robert P. Balles Prize in Critical Thinking from the Center for Skeptical Inquiry and was selected by National Public Radio as one of the best books of 2013, and Bad Faith: When Religious Belief Undermines Modern Medicine (Basic Books, 2015), selected by the New York Times Book Review as an “Editor’s Choice” book in April 2015. Offit has also written Pandora’s Lab: Seven Stories of Science Gone Wrong (National Geographic Press/Random House, April 2017) and The Hitchhiker’s Guide to Science and Health (manuscript in preparation). In 2017, he also became a weekly columnist for The Daily Beast.